Hello! I want to know the general characteristics of leaves and fruits for both hardwoods and softwoods. Thank you! First, the term "softwood" is used as a synonym to conifer, because conifer generally have softer wood than flowering trees, also known as hardwoods. Below, I will use the word conifer. Hardwood trees are flowering plants (Angiosperms (Plant producing flowers and fruits.)). Angiosperms ovules are contained in ovaries that will give a fruit with seeds. There are many different types of fruits. You can see some examples in this fruit slide show. Conifers are part of a botanical group called Gymnosperms (Plant with free and "naked" seeds, not enclosed in an ovary and not protected in a fruit.). Gymnosperms ovules, free and not contained in an ovary, are directly fertilized by pollen. The seeds are "naked", supported on cones and not protected within the fruit as in Angiosperms. In the botanical sense, the seeds of a fruit must be protected, so Gymnosperms do not bear fruit. 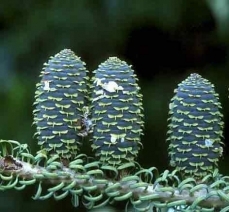 Cones act as reproductive organs: small male cones and larger female cones that bear seeds. The main characteristic of the leaves of deciduous trees is to have a large area. This is the leaf blade, which captures a maximum of sunlight. Temperate hardwoods lose their leaves in the fall to protect themselves from winter. In other regions, deciduous trees can also lose their leaves when the dry season arrives. But all hardwoods do not lose their foliage during a particular season: some tropical trees have not developed this adaptation. We then say that they are evergreen. As the leaves have a limited lifespan, such trees still shed their leaves, but the replacement process takes place gradually during the year and is not linked to seasons. Conifers have leaves composed of needles or scales. The needles and scales have not developed a blade like hardwood leaves and are therefore much smaller. The structure of the needles and the wax layer that envelopes them, the cuticle (Protective layer of the epidermis. ), allow them to reduce sweating and prevent water freezing inside the leaves. Most conifers keep their needles in winter (and thus remain green). Scales and needles have a longer lifespan than leaves, usually years. Some conifers lose their leaves seasonally, e.g. larch. They are, however, the exception to the rule. You can learn more about leaves, needles and scales in this slide show about tree foliage. I hope you find this information useful. Have a good day! Do you want to send us a question or share a story? Please write!